Whether or not Duterte actually wins in the coming presidential elections, he has already scored a victory by becoming a folk hero for many Filipinos: those who are disenchanted with our democratic institutions, those in Visayas and Mindanao who feel underrepresented by an “Imperial Manila”, those who are fed up with usual names in politics, and those who are searching for authenticity in our leaders: an authenticity they can relate to. Folk heroes, furthermore, are, “ambiguous figures”. Australian folklorist Graham Seal points out that “Many folk heroes walk a thin and fuzzy line between the admirable and the rephrensible. This line is seen is seen most clearly…where the practicalities of defying the law are continually balanced by the injustices - real or otherwise - inflicted by those who control the law.” Like Robin Hood breaking the law to serve the poor in the time of King John’s tyrannical abuses, Duterte’s seeming willingness (by his own words) to resort to extrajudicial measures has alarmed many, but has, in equal measure, convinced others of his heroic qualities. Sociologists point out that folk heroes embody cultural values - so much so that many scholars actually study folk heroes as a way of understanding the cultures where these heroes belonged. In looking at Duterte as folk hero, then, we can make sense not only of the appeal of his candidacy, but of values many Filipinos hold dear. 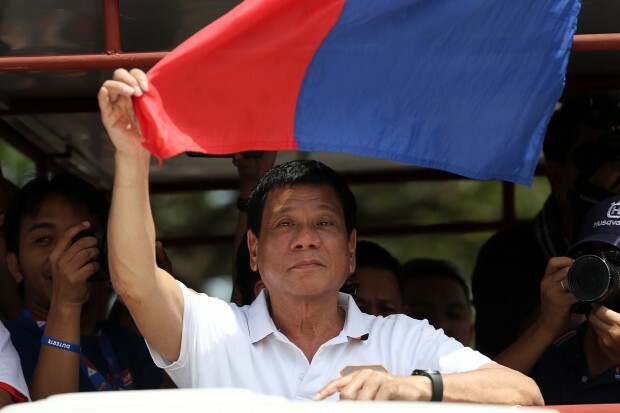 Part of Duterte’s appeal lies in his promise of doing things differently in government. Held in the context of the still-unresolved Maguindanao massacre and Mamasapano “misencounter”, his willingness to resort to extraordinary measures serves as a sign of his potential to break the status quo in many other areas. This anti-establishment posture resonates with many who believe that the present system needs changing: those who feel that the problem is Filipinos’ lack of disipline, those who lament the continuous degradation of our natural resources, those who have not felt “inclusive growth” despite claims of an improved economy. Another part of Duterte’s appeal is in the way he represents Mindanao, Visayas, and the rest of the Philippines outside of Manila. Whether warranted or not, many feel left out, and think that someone from Davao would be more understanding about the concerns of Cebu, than someone from Luzon. Boosting this case is Duterte's espousal of federalism - something that many regions have long been clamoring for. Duterte’s perceived freshness in national politics is also appealing. While Poe, Binay, Santiago, and Roxas are surnames that have held - or ran for - national positions for decades, this is the first time a Duterte will appear in a national ticket. While this does not mean that he is no political dynast (his daughter Inday was mayor of Davao; his father Vicente was governor of the then-undivided Davao province), at least in the national level he is perceived as new. Finally, Duterte’s appeal lies in the way people can relate to him. Unlike the mansions (alleged or real) of his rivals, he has a modest house in Davao with a kulambo in tow. While pundits cry foul over his not-so-subtle allusions to womanizing, many actually see his womanizing as a sign of strength and authenticity (at least, the thinking goes, he is honest about it, unlike others who are hypocritical). While pundits cry foul over his use of swear words (something that he has disavowed), it is a language of the street that nether Mar Roxas, with his Ateneo and Wharton education - nor Miriam with her eloquence - can emulate. It is the language that makes people say that “he is one of us”. Folk heroes, however, are the stuff of legend, not of reality, and Duterte is already taking on a legendary character thanks to his ardent followers, who have given him apocryphal endorsements coming from Stephen Curry, AlDub, and even the Pope (which the CBCP had to refute). It is to Duterte’s credit that he can inspire such tales, but what they construct is an image of an infallible leader that is unhelpful to Duterte himself as he needs to be pushed to become a better candidate - not worshipped for what he already is. Moreover, in the process of making someone a folk hero, people make villains of out his enemies, at times with outright lies (i.e. the fictional nurse who bashes Roxas’ Yolanda response). This is not helpful to our political process. If he loses the elections, Duterte will still live on as a folk hero, and a potent reminder of people’s dissatisfaction about our democratic processes, of the need to pay attention to the entire country, and of people’s growing mistrust of old names in positions of power. He will inspire others to emerge and take up his double-edged sword of no-nonsense leadership. If he wins, he can capitalize on his popular support in pushing for badly-needed reforms in government. However, with the very high expectations he has set (i.e. “Kill me if I don’t resolve crimes in 6 months”) in the performance of this folk heroism, will he be able to deliver on his promises? Only the elections will tell if enough people are willing to give him a chance.